At 7:30 PM, with two tickets to the movie of Liz Alexander’s choice, Liz and her husband Ed bought a large Diet Coke and some popcorn and headed into the movie theater. Two hours later, they came out and headed to the rest rooms. “Meet you right here,” Liz called to him as they separated. “Here,” the kid replied with an annoyed tone, pulling his cell phone out of his pocket. Liz dialed Ed’s cell phone number, but it immediately went to voice mail. Damn. His phone is off. Where IS he? Liz sat down again. Where could he have gone? Maybe he’s waiting outside instead of in here. It’s stuffy in here, she rationalized. She stood up and headed out the main doors, looking around as she did. He wasn’t in the plaza area outside the theatre, either. Maybe he’s getting the car, she thought. I’ll go out to the drive and wait until he pulls around. Ten minutes later Liz was totaling panicked. I don’t even know where he parked, he dropped me off to get the tickets. What the hell do I do now? She decided to check one more time in the theater and talked her way back inside by asking for the manager. “What seems to be the problem?” he asked solicitously. A mall cop came and took down her information and listened patiently while Liz explained one more time what had happened. By this time, she was hyperventilating and had to sit down on the theater bench again. “And he didn’t say anything to you when he left for the restroom?” asked the cop. “It’s a Jeep Grand Cherokee, about five years old, dark green, license plate HVN 405,” Liz answered automatically, without waiting for more specific questions. After a few more agonizing minutes of interrogation, the cop did go into each theater and ask the patrons if there was an Ed Alexander in the audience. There wasn’t. In the meantime, another cop was called who searched the parking lot for the car, but didn’t find it. Finally, the mall cops called the local police, who took Liz home after asking her the same questions again and assuring her that her husband would be waiting for her when she got there. He wasn’t. The policeman who drove her home came in with her and made a perfunctory search of the house. Liz had looked in the closets and drawers to see if Ed had taken anything and found nothing obvious missing. “No, everything seems to be fine,” she replied. Haven’t had that experience, thought Liz. Ed had come into her life six years earlier, at a time when she had been divorced for two years. Her first marriage never should have happened; she was too young and her husband became a stranger who liked alcohol better than her and beating her even more. Without a college degree, she had been stuck in part-time and menial jobs. It was nothing less than a miracle that she had found the courage to leave him, but after moving back in with her parents, she’d been so depressed that she’d even contemplated suicide. All that changed when she met Ed at a church dinner. He was everything she could have hoped for. Older than she but with a youthful outlook – supportive, funny, and encouraging. He had a good job as the owner of a medium-sized insurance firm and took her to nice restaurants and treated her with respect and kindness. After everything that had happened to her, she couldn’t help falling in love with him and occasionally wondered how she could have been this lucky. They were married six months later and since that time, at Ed’s insistence, Liz had gone back to a community college to take business courses and was currently managing his office. Being married to Ed was wonderful, and the only thing she regretted was that she had been unable to get pregnant. Liz called all their friends that night and her parents. No one had seen Ed. She went through the house again, this time more thoroughly, but could not find anything out-of-place. All of Ed’s clothes were there, nothing was missing. Later, her mother came over to sit with her while Liz waited by the phone, desperately hoping for a call from Ed. Her Mom made her coffee, hugged her, and made sympathetic noises. By late the next morning, when the secretary from work called to ask why Ed and Liz were not there, Liz made the excuse that they would both down with bad colds and asked her to cancel any appointments and reschedule them. Her mother finally started to ask questions that alternately made her mad and despair. This line of questioning went on repetitively until Liz filed the missing person’s report, at which time her mother went home. Once the report was filed, Liz broke the news to the office and consulted a lawyer about the business. She discovered that Ed had recently written a will, which stated that in the case of his death or disappearance, Liz was to run the business. Once his death was established, the company would come to her. The wording was odd. Was he planning to disappear? Liz wondered. But why? Why would he leave me? Something must have happened to him. I thought we were happy. Mentally, she started dissecting her marriage, looking for any hint that Ed was unhappy, something she might have done. The only thing that stood out was the fact that Ed had been a little short-tempered and preoccupied the last few months, but when she’d asked if anything was bothering him, he’d told her everything was fine. She spent hours going over and over this in her mind, unable to focus on her work, until the day the police found his car. The car was located at a distant airport in the fly and ride lot. It had been there, according to the attendant, since the night Ed had disappeared. In the car were his wallet, his phone, and some clothes. The police brought the car in for forensic technicians to examine and brought the belongings found in the car to Liz for identification. “Yes, this is his wallet and phone,” replied Liz to the policeman’s query. Liz started going through the neatly folded pile. “Yes. This is what he is wearing.” As she got to the bottom of the pile, she inhaled sharply. At the bottom of the pile were his underwear, socks and shoes. “Oh my God, the people who took him must have stripped him!” she cried. “Well, we are checking all of the flights that left the airport around the time the car was parked. And we are checking the car for fingerprints and any trace evidence that might help us find him. I assure you we’ll let you know as soon as we find anything at all.” This last was said with sympathy and concern, but Liz just shook her head and walked him to the front door. A week later, the same policeman came to her house after the dinner Liz would normally have eaten, but now had no stomach for. She let him in and sat with him in the living room, making sure that he did not sit in Ed’s seat. She couldn’t have handled that. “Have you found anything?” she asked hopefully, but she had known from the moment she opened the front door that the news wasn’t going to be good. Liz’s head and shoulders sagged. “Now ma’am, don’t give up. We’ll continue to look. We won’t give up, I promise, and you shouldn’t either.” The kindness and sympathy in the man’s voice finally registered, and Liz looked up. She didn’t even know this policeman’s name. He had told her, had given her his card, but it hadn’t registered. “That’s the right attitude, ma’am. Keep your chin up.” This last was said with a smile. Liz and Officer Mullins talked for some time after that, about Ed, her marriage, her job, and by the time he left, she felt a little stronger. Over the next few weeks, she somehow managed to go to work and focus, but she couldn’t hold down food, and at the insistence of her mother, finally went to see her physician. Liz was shocked when she was told she was pregnant and burst into tears. How could you? she thought, finally angry at Ed and at the same time guilty about being angry. Leaving me just when we are going to have a child! Your child whom you’ll never see. How could you do that to me? By the time two months had passed, during which her middle had expanded along with her anger at Ed, she decided to have the company’s books audited. What she found shocked her. Ed had been embezzling money and had left her with a nearly bankrupt company. Why did he do this? Why didn’t I see this? What did he need the money for? she asked herself, again and again. Liz sold the house and Ed’s car and moved to an apartment, using the money to prop up what she now thought of as her business. By that time, seven months had slipped by, and Liz found that she could go for hours at a time and not think about Ed. When Bill Mullins, the policeman, continued to call her, never with any news but just to talk, she found that she enjoyed his attention and eventually they had dinner together. The following evening, her mother came over to bring some baby things she’d knitted. “I called you last night but there was no answer,” she said offhandedly to Liz. Liz sighed. Her mother had been a strong support for her in the days after Ed’s disappearance, and she was grateful for that, but she was stung by her criticism. How long do you wait for a man who disappeared without a trace? Without even his clothes, she wondered. Two years, five years, ten years? Why isn’t she blaming Ed? Doesn’t she understand how really angry I am? Liz continued seeing Bill, who didn’t seem to mind the fact she was pregnant and deserted by her husband. He was gentle and reassuring and over a few weeks, she came to trust him and found herself considering whether she should allow the relationship to develop any further. One Saturday afternoon, there was a knock on the door. Liz opened it. It was Ed. He had dyed his hair a lighter shade of brown and was wearing a cheap-looking business suit and garish tie. Good Will, she immediately thought. Her mouth opened to say something, but no words emerged. “Well, aren’t you going to welcome me home?” Ed asked, with a smile, as if he had been away on one of his business trips. “Miss me?” He reached for her to give her a hug. Liz realized that when the original shock of him being gone had passed, she hadn’t missed him all that much. She loved her work, it kept her busy, and Bill Mullins had stepped in and filled her life. Or was she just deluding herself again? “No. Call me later.” She slammed the door in his face and locked it. Liz counted to ten and then carefully peeked out the front window. Ed, scowling, stood on the stairs for a minute and then walked back across the street to a compact car that looked like a rental. After a few minutes, he peeled out. Where had he come from? What had he been doing all this time? And why did he come back now? Thoughts raced through Liz’s mind, with a growing sense of outrage. Of course, now the business is doing well, and he’s going to want it back. She headed to the phone to call her company’s lawyer. Unfortunately, Ed had gotten to him first. The lawyer told her Ed was still the owner of the company since he hadn’t died, and the will had specified that unless his death was confirmed, Liz was just to run the business in his absence. What a fool I was, she thought. I should have just let the business fold and his reputation get dragged through the dirt! He deserves it for what he did to me. Where is the man I married? She sat down with a cup of tea and pondered her situation, and eventually decided to wait until Ed called. Once he gave her an explanation about where he’d left and where he’d been, she could decide what to do. But he didn’t call. Bill stopped by that evening and she told him what had happened that afternoon and what she’d found out about the business. When Liz went into work the next day, she figured she’s see Ed, and sure enough, he was there, sitting in her office at her desk. Her things were piled outside the door. Ed motioned her to come in and sit down. “How are you?” he asked solicitously. “Well, I’ve already filed for divorce,” Liz bluffed. “Go ahead. You won’t get a cent,” Ed said with a certainty that filled Liz with both anger and fear. Liz left the office with her belongings in a rage. When she got back to her apartment, her first phone call was to a ball-busting female divorce attorney that she’d met at a town dinner for business owners. Liz spent the rest of the day walking aimlessly around her apartment, talking to herself. One thing Ed didn’t know was that she had her own savings account, which she had originally meant to be for a rainy day or special gifts for him. It was fairly substantial by this point, plus she had added some of the money from the sale of the house, but it would be eaten up by her lawyer’s bills and the necessary accountants. Several weeks went by, Liz met with her lawyer, and it appeared that she might get a reasonable settlement, but it was going to take months of bitter confrontations, her baby would be borne by that time, and the question of custody was complicated. In the meantime, she quietly looked for a job, but in the current economy, companies weren’t looking to hire a pregnant woman, no matter how qualified she was. Ed was sending her weekly checks, which were enough to pay for food and a tank of gas. The rent was paid, and Ed insisted on accompanying her on her visits to the obstetrician, as a condition of his paying for them. She threw a tantrum the first time he insisted on coming into the examining room with her, and as a result her physician, to whom she had confided her story, insisted he stay in the waiting room. Liz had screwed up the courage to tell her mother what was going on, the day after Ed returned. Her mother had been so insistent that Ed was not to blame that Liz had found ways to avoided her ever since. This day, her mother wouldn’t accept that Liz was not home and made such a scene at her door that Liz had to let her in. “I knew he’d be back,” said her mother confidently, ignoring Liz’s scowl as she settled into a comfortable chair and prepared for another blame game. Liz drove to the Royale and dropped her mother off to get the tickets while she parked the car. After the movie was over, Liz told her mother that she had to use the restrooms. The baby was pressing on her bladder. Her mother waited for her out in the lobby. When Liz didn’t come out of the restroom after ten minutes, she went in to look for her but didn’t find her. She went to the kid taking tickets and asked, “Can you help me? I seem to have lost my daughter. She’s eight months pregnant.” The mall cops were called and a search of the movie theater yielded no sign of Liz. When the local police finally arrived and searched the parking lot, Liz’s car was not there, but an unattended police car was noted. I hope you find a suitable vehicle for publication. It deserves it. Maybe Alfred Hitchcock’s magazine? It has that quirky sort of an ending that a lot of the stories in that publication possess. I enjoyed your story, Noelle. Nice switch. Hope she ran off with the policeman. Though some appropriate revenge left in her wake would be satisfying as I do like to see the wrong ‘un get his comeuppance! Thanks Geraldine. Glad you enjoyed it. It’s a little different from my book(s), but I wrote it several years back and my critique group suggested putting it on my blog as a Christmas gift. Did I manage to “follow” your blog? What a marvelous site – I ran around it, exploring. Glad you enjoyed my site, Noelle. I’ve been having it redesigned. This seems to have undone a lot of the features I’d already created, as well as done dire things to my list of followers. According to my site stats, I’m Geraldine No-Mates as it now tells me I have no followers. 😦 Oh dear! One step forward, ten back. But pleased you managed to find things to entertain you. Or just find things . . . Anyway, very best wishes with your writing career and I hope it goes great in 2015. Oh dear. Do let me know when the site accepts followers again. 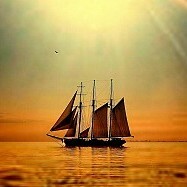 You can reach me at sailingawayng@gmail.com. What a great story and such a splendid twist! Thank you! Glad you enjoyed it. I was in a snarky mood when I wrote it! Great story and I like how you tied everything together so well at the end. You painted very credible characters too. Hmm..could definitely see this one being a true story and I really wanted to knock Ed’s lights out. Thanks, Roweee, glad you liked it. My books are not quite as snarky, but they are also set in Pequod and John Smith is a investigator with the police department. Had to write hm out of the book I’m working on now because of this side story, but he will be back! I am heading for serious trouble meeting authors on my blog. I am a serious bibliophile as is my husband, which has also meant that our kids have loads of books too. Everywhere you look in our house there’s a stack of books begging for a shelf. I have been thinking about setting a no book buying policy until I’ve cleared the decks a bit. It would make good sense for me to switch to Kindle but it doesn’t feel the same as a book and I don’t really think it god for your eyes. The new Kindle paper white would work for you – easy on the eyes, I also resisted getting a Kindle, but once I had one, it has never left my side. I still read real books but for carrying around, since I have to find odd times to read – it is perfect. Trips etc.